The new 2017 Range Rover Sport and 2017 Volvo XC90 are two of the best luxury SUV’s to roll into the market in the last 12 months and a great option if you’re finding the current offerings from the big German three a bit sterile. 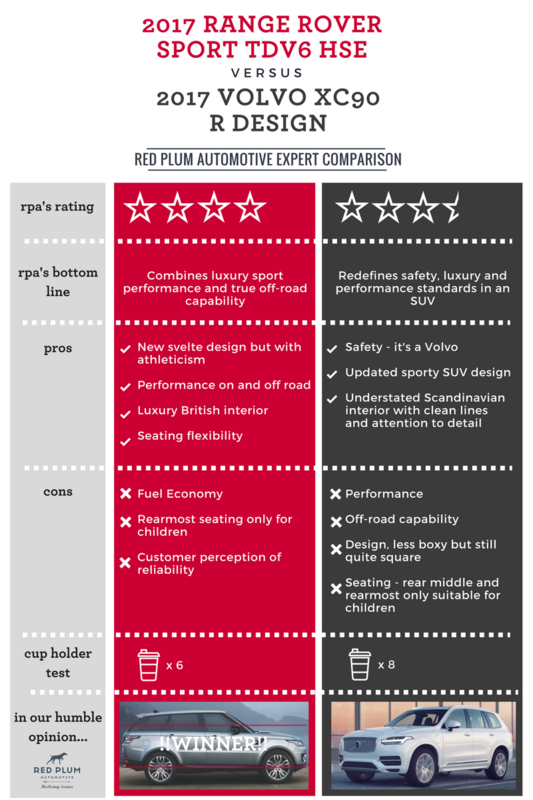 Find out what we thought in this week’s expert comparison; the 2017 Range Rover Sport TDv6 HSE VS. 2017 Volvo XC90 R Design. The experience with the Range Rover Sport begins long before you get in the car. Let’s be honest, quite simply put it’s a cool car. There are very few brands on the planet that command such a loyal following. And despite some ongoing reliability concerns their brand continues to grow. Land Rover’s designers have been paying attention to current market trends and the new 2017 Range Rover Sport sees a departure from the traditional boxy model. It’s smaller and lighter and when you opt for the TDV6 HSE model it’s now definitely one of the more fuel efficient in the Range Rover family – a compromise that hasn’t come at the cost of its’ power and off-road capabilities either. However, when you’re comparing the 2017 Range Rover Sport TDv6 HSE VS. 2017 Volvo XC90 R Design the former is nowhere near as roomy though which is the trade off for that super slick, new city style shape. • An evolutionary departure from the traditional boxier design. • Sporty and athletic in its stance. The Range Rover Sport HSE has always been built using high-quality materials such as aluminium in the chassis and body panels. There is also a liberal use of high-quality leather and soft-touch plastics in the cabin. The whole car gives you the sense that you can choose to go on an off-road adventure at any time in the highest of luxury. • The Range Rover Sport HSE uses perforated Oxford leather and is available in a plethora of colour combinations allowing the buyer to truly express their personality. Poor Volvo has received a bad wrap over the last few years. The classic “How’s-your-day-Volvo-driver” has proven a tricky connotation to overcome. But this Scandinavian car brand has managed to engineer a serious image revamp – with the 2017 XC90 heralding a new age in Volvo’s history. • The design language for the XC90 R Design is not unlike what made the Scandinavians approach to furniture famous. “How do we design our product to make a person’s life easier?” In this case, sportier too. • The R Line offers solid road presence with its 20” R Line bespoke wheels, R Line exclusive body mouldings, huge dual exhaust pipes and its “Hammer of Thor” LED drive lights. • It’s a Volvo. There simply isn’t enough space to list them all. But the new pilot assist should be noted, now active for speeds up to 130km/h and no need for a lead car. • City Safety mode is another, brakes will automatically be applied if another vehicle, pedestrian or bicycle wander into the path of the car for speeds up to 50KM/h. • While the Volvo is down on power compared to the Range Rover Sport it still achieves a very impressive 0-100KM/H in just 7.8 seconds. • R Design seats beautifully support and contour the driver and are finished in fine Nappa leather. • Similarly, the R Design steering wheel is wrapped in perforated leather and offers paddle to shift all eight gears at the driver’s finger tips. • The 12.3” touch screen display is neatly integrated into the Volvo’s dash with effortless continuity between Bluetooth and music functionality. Of the two choices for audio we suggest the Bowers and Wilkins for that extra special sound. • With safety currently a hot topic, a feature that stands out for us is the Run Off Road Protection package that is standard in this car and a world first. It is aimed at achieving Volvo’s vision that no one will be killed or seriously injured in a new Volvo car by 2020. So, 2017 Range Rover Sport TDv6 HSE VS. 2017 Volvo XC90 R Design – who comes out on top? We think it’s a pretty close race. The 2017 Volvo XC90 is a serious contender in the luxury SUV market and has helped Volvo smash through their old brand. But for us, the victory has to go to the Range Rover Sport HSE thanks to it’s impressive off road capabilities. This is truly a luxury SUV that can take you from city to country. Already made your mind up? Check out our car buyer’s checklist to save yourself time, money and stress.